People volunteer for a lot of different reasons and those that choose to apply to volunteer at the police department are no different. Perhaps it is the sense of service to others, a soft spot in your heart for victims of crime or you have an underutilized talent that you feel compelled to share. 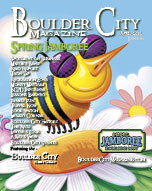 Whatever the reason, Boulder City is a safer place to live, work, and visit as a result of your combined efforts. And for that, I say thank you! Starting with our volunteer Auxiliary Division nearly 10 years ago, Lance Johnson has served in numerous capacities. He manages much of our auxiliary staff functions, has tabulated department statistics, represented the department at various regional ceremonies and functions and has served as a friend and mentor to many members in the department. A dedicated professional, Lance has gone a long way in making our volunteer efforts bring true value to the organization and the community we serve and protect. We also have an active Police Explorer Program, largely due to the efforts of Detective Scott Pastore. Scott spends countless hours and puts in an extreme amount of effort - much during personal time - working with the young men and women who want to learn more about the police profession. You will see the Explorers volunteering at a variety of events as they work alongside the officers to direct traffic, assist with crowd control or take reports. They provide a lot of value to the department and to the Boulder City area as they strive to make Boulder City a better place for all of us. Lastly, I would be remiss not to mention our own staff. We have many members of the police department that share their diverse talents in different volunteer capacities. Many are involved in their church and the schools their children attend. Several employees volunteer for organizations like Special Olympics, Boys and Girls Clubs of Las Vegas, Injured Police Officers Fund, Rotary and Scouts  just to name a few. As we strive to welcome volunteers in our work space, we feel it is imperative that we also promote our own spirit of social responsibility to make Boulder City a better place to live, work and visit.